If you love your coffee, you’re probably no stranger to preparing your favorite cup at home. According to Reuters, more than 65% of Americans indulge in a daily dose of coffee, and if you’re among them, you’ll probably appreciate that sometimes that cup just tastes better than others. So what accounts for the perfect cup of coffee? While answers may vary depending on who you ask and how they like it, there is one thing most baristas and major coffee chains agree on — the quality of the water. How Does Water Quality Impact Coffee? Coffee is primarily made of water, so it stands to reason that the makeup of the water used to brew it can impact everything from taste to smell, and more. In much the same way the quality of ingredients impacts the flavor of cooking, the quality of the water you use determines how fresh and vibrant your coffee will taste. One of the biggest culprits when it comes to home-brewed coffee tasting off is the hardness level of the tap water used. Hard water typically refers to water that has higher levels of dissolved minerals in it, like magnesium and calcium. While small amounts of these minerals can positively impact taste, and even benefit our health, too much of a good thing causes problems – especially for your coffee. 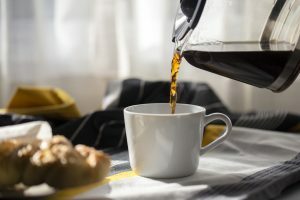 Dissolved minerals often hijack the flavor of brewed coffee, leaving it tasting acidic, bitter, or worse, depending on the levels and kinds of minerals. Even a small amount of dissolved sulfur, for example, can lend an unpleasant aroma of rotten eggs to your morning cup. Hard water also creates problems for the coffee makers themselves, leading to build up that impacts not only the way coffee tastes, but also how hard your coffee maker has to work to make it. If you live in an area with hard water, you’re likely familiar with the build up that accumulates on fixtures and appliances, and how much of a headache it can be to clean it properly. This buildup can also dissolve into coffee as it brews, further impacting the taste and quality of your coffee. According to Reuters, more than 65% of Americans indulge in a daily dose of coffee. In addition to hard-water minerals, other common water additives impact the flavor of brewed coffee. Extra chlorine especially can leave coffee tasting off, and is one of the main reasons coffee chains like Starbucks use coffee water filters. When your reputation depends on creating dependable, replicable beverages, filtering water for coffee is the best place to start. The best cups of coffee start with fresh, filtered water, and one of the easiest ways to access it is with a reverse osmosis drinking water system. These filtration systems are designed to remove the minerals and chemicals that can leave your water, and your coffee, tasting, smelling, or looking less than its best. Your Culligan Man can talk you through some of the best solutions for your particular tap water to get the best coffee, and help you determine what makes sense for your home and your coffee habits.